Our first patient of 2018, a Florida box turtle was admitted with a partially amputated right hind leg. Veterinarians suspect the wound was caused by a predator attack. Due to the presence of maggots in the wound, it is believed to be at least 24 hours to a few days old. The wound was flushed with sterile saline and Capstar, a treatment to rid the wound of the maggots. 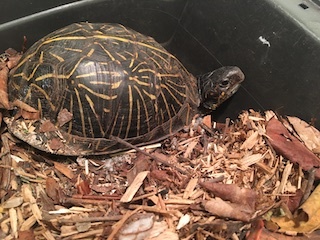 The box turtle has shown no signs of being slowed down by its missing limb. It remains very mobile and has a great appetite. 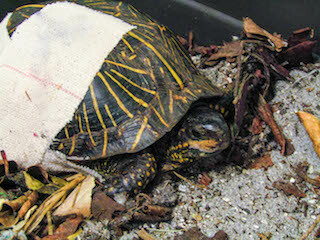 After the wound was determined to be clear of maggots, the box turtle was taken to surgery to clean up the partial amputation. The remaining exposed fragments of tibia and fibula were removed at the stifle (knee joint) and the wound was debrided of necrotic, or dead, tissue. The wound was then closed and sutured around the femur. 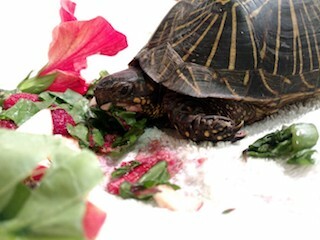 Rehabilitators say the box turtle is doing very well. It eats and grazes well, showing it has a healthy appetite. They also say it does not show any signs of mobility issues due to the missing part of its hind leg. 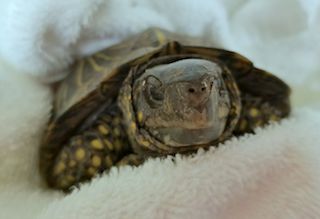 Veterinarians stated the amputation site looked great and the box turtle had no issues with mobility or appetite. It was released on Sanibel on Sunday, January 21.